An internet blackout by some of the internet heavyweights is looking much more likely. Mashable, one of the biggest tech websites out there, published an editorial calling for a campaign to inform the masses about the danger posed by SOPA. Facebook, Google and Wikipedia. You’re the Big Three in this fight. You’ve already publicly affirmed your opposition to SOPA. Now it’s time to really be a part of the fight. Everyone in the tech community knows about SOPA, but that isn’t enough – the anti-SOPA movement needs the average Joe to understand and protest against the bill. Of course, we really need Google to get involved. After all, ‘Don’t be evil’ is their informal corporate motto. They have stepped up to the mark before by removing Google search capabilities from China, now we have to hope they are prepared to step up again. The SOPA bill is the desperate bite of a wounded and dying entertainment industry. The internet has liberated artists and content providers. We are seeing the emergence of an organic internet marketplace, free from the layers of middlemen that have exploited artists for so long. They have been creaming money of the work of others for so long that they think what they do is natural. January 18th is set to be an important day for the internet. How important is up to the big three. Today offered a glimpse of a truly amazing future for conscientious shoppers that want to boycott products. A team of anti-SOPA activists (read about the Stop Online Piracy Act here) have created an app that allows you to scan a barcode from a product and see whether the product is made by one of the 800 SOPA supporting companies. It works by automatically checking a product against a database of companies. If the scanned product comes from a SOPA supporting company, then a big red ‘x’ is displayed on the screen – enabling the shopper to chose not to purchase. The idea behind the boycott app is brilliant and could be applied to anything. Simply change the list of companies in the database to whoever you want. If, for example, you want to boycott GlaxoSmithKlein after hearing about their exploitative and illegal vaccine tests that killed 14 babies – you could add them to your ‘boycott list’. Don’t like Coca-Cola for any of their irresponsible acts – add them to the list. In a world where mobile app’s seem to be the domain of marketers – it is refreshing to see mobile technology being used by activists to empower consumers and help hold corporations accountable. Ideally this tool should become opensource so that any activists or consumers can create their own unique database of companies to use with the app. Campaigning groups could make lists for supporters to upload to the boycott app. It could even be used to discover things about products when in a store – e.g. this cereal manufacturer CEO kills baby seals or this fashion designer has links to the far right. Barcode scanning is something that is set to become more popular among consumers. This app is the latest incarnation of a broader trend of scanning technology. Amazon recently released a popular mobile ‘Price Check’ app that encourages consumers to scan products they come across in bricks and mortar stores and receive a discount if they buy the product online through the Amazon app. You could argue that the time it takes to scan every item of a weekly supermarket shop would be a barrier. However, jump a year or so in the future and every item will contain a RFID (radio frequency identification) chip, which is a superior and more efficient method of identifying objects than a normal barcode. Then the same kind of friction-less technology we are seeing with Facebook will be a part of our shopping experience. Put a product in your shopping basket and your phone will give you a little alert if it is to be boycotted. Check out this ubercool video on the RFID future of shopping to get what I mean. Google+ seemed to take up the lions share of my predictions for 2012. It is the most interesting and promising social network out there. Facebook, Twitter and LinkedIn all have their place, but Google+ is still surrounded by a suggestive veil of mystery. However – despite all my interest, I don’t actually use the service that much. So with a new year starting I thought I would dive in and see what pearls I can find. A point raised by Ezra Klein over on Quora is that Google+ allows you a fresh start. Furnished with all the skills you have picked up from four years of Facebook and two years of Twitter, Google+ gives you the opportunity to ensure that people are correctly grouped and avoid any miscalculations you may have previously made. I used to be a massive fan of social bookmarking and I used to religiously save all the interesting links I found to Delicious. This changed this year for reasons that escape me. I think it was a combination of a forgotten password, a broken plugin or fears that Delicious was to close that stopped me bookmarking everything. However Google+ looks set to bring me back into good bookmarking habits. The G+ button that you see at the top of webpages and next to search results act as a one click bookmarking function that saves the page you are viewing to your public or private +1 page (here’s mine). The problems are that you cannot tag links like you could in Delicious and you cannot currently perform searches on your list of +1’s. I imagine this will all be changed soon, and you will be able to search your +1 bookmarks from the Google homepage. After all, Google intends your +1 page to be ‘the place you’ll go to personally manage the ever-expanding record of things you love around the web‘. Every so often I need to give my Google RSS reader a clean out. I am constantly following new websites and removing others from my feed. On Facebook – I am careful to follow only a few websites and brands in order to ensure my Facebook news feed doesn’t get clogged. However, when I am subscribing using Google Circles I am instantly encouraged to categorize each subscription. I can have a tech news circle, a recipe circle and film circle. I can have a circle dedicated to particular thinkers and a circle for particular colleagues. And – I can drop people and websites in and out of circles with ease. You could argue that this is not much different to Twitter lists. Yet things seem easier and more integrated with Google than it does with Twitter. It is also easier to have longer and sustained conversations around a post than is possible with Twitter’s 140 character limit. The Google+ feed is also more visual and exciting than with other social networks. Google are search – so it makes sense that searching for people on Google+ should be perfect. There is already a directory that has indexed over 31 million users called FindPeopleonPlus which allows you to restrict a search by the profile information logged by Google. This kind of people search is something lacking in Twitter. The Google+ profile is also something that will become increasingly important. Unlike Twitter which restricts you to 140 characters – Google lets you create a full profile that will act as your shop window to all of your Google activity. This website lets you create a magazine like page with content. You log in, think of a topic, grab your url (www.scoop.it/example) and begin adding article you find using your browsers ‘Scoop’ button. The website does all the work of making the page look nice, but you can customize the style if you wish. And, if you looking for help finding content, Scoop It will give you a list of recommendations for your topic from around the web. It has all the social media plugin’s you need, a daily email update on both your topic and other topics you follow and an easy way to explore new topics. Check mine out here about the war on drugs, or this good one on new web tools. Storify lets you gather content from a variety of social media platforms and order (and reorder) it all into a single stream. It is an ideal platform for following a Twitter conversation and quickly pulling out good tweets, adding some comments, and slotting in any relevant media. It is also offers to send a notification to anyone mentioned in the Storify project. Because of it’s ease of use and clever design, Storify is seeing vast adoption across the web. Popular website ReadWriteWeb use Storify to curate answer to their regular ‘Big Question’ from across Facebook, Twitter and their own comments section. It is also the ideal way to curate an event that has a strong Twitter engagement. A Pearl Tree is an attractive and elegant way to display the relations between webpages of content. A pearl is an item of web content (YouTube video, webpage etc) which you link to other pearls which contain similar content to create a pearltree. It’s ideal application would be as a visual guide to a topic, taking people through different networks of thought. 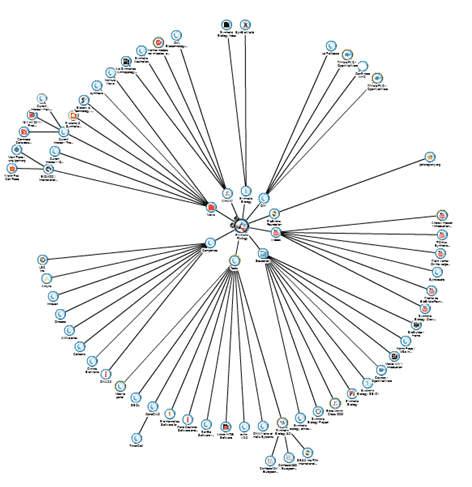 For example – this pearltree explores the concept of the virtual currency of BitCoin. Projeqt seems to be a very polished and stylish way of curating content. It’s functionality is quite basic and works in a similar way to a Powerpoint presentation. You arrange your content (videos, pictures, text, RSS, Twitter) onto a series of slides and let the user glide through the story. This platform would be ideal for showcasing a series of pictures with short comments in between. For a good example of the possibilities, check out this example by Brain Pickings. Pinterest dubs itself as an online pinboard. 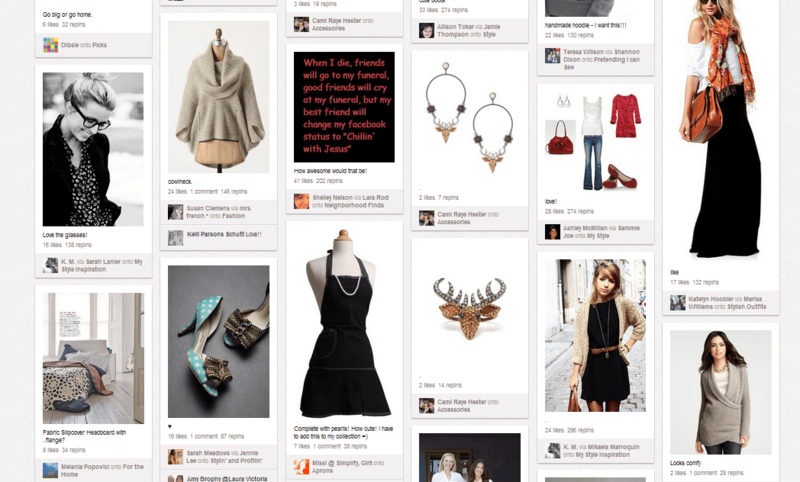 You pin things you find to your own virtual pinboard page and find other people to connect to with similar interests. The layout is both simple and appealing. It looks suitable for visual based curation and has seen early adoption within the craft and art worlds. Promotionally, Pinterest is aimed at the casual user, and not so much the professional curator. Uses include planning a wedding, redecorating your home and sharing recipes. I’ve been looking for a service like this for a while! Redux is a curation tool for video. Create your own channel and curate videos around your theme. The user experience is pretty sleek. After clicking on a channel you are taken straight through to a full screen video with controls to move on to the next one or pause. As a curator, you can add videos to pre-existing channels or create a channel of your own. The screen for curators isn’t quite as stylish as the viewer screen, but functional enough.